Challenger (CGF) is our largest equity position in the super fund and investment portfolio. There is not alot of companies the ASX 200 index with a big moat as Challenger. We like CGF because it is a thematic play on the retirement of the baby boomer generation. ASX CGF embedded within a growing sector is misunderstood by the market. Going long Challenger is a no brainer. It contains attractive long term compounding earning growth from the Challenger annuity business and a funds management business that is firing on all cylinders. First look at the results shows it had a good first half. AUM: total AUM while flat grew 10 if the including the sale of the Kapstream business. Normalised NPAT: Grew strongly helped by a lower tax rate. Excluding the lower tax rate, it is still a credible result. Expenses: While cost to income for the group came down 0.60% in 1H2015, on a segment basis, it went up for the asset management business. We are keeping an eye expenses especially in the funds management business where we felt it has always been on the high side and at times grew faster than revenue. Statutory Result: Lumpy due to volatility in investment return including sale on gain from Kapstream sale. Payout Ratio: 50% at current run rate with tailwind from DRP plan. Life Business: Strong annuity sale excluding discontinued Care products. Interesting focus on the potential of additional distribution channel. We always liked CGF ASX because it has one of the only major annuity business for Australian retirees. Now instead of clients goto CGF, CGF will leverage its market position by increasing distribution capabilities. Capital: Steady as she goes, especially with the retained equity from dividend reinvestment plans. Funds Management: Good growth in the AUM even after sale of Kapstream and purchase of Dexion (Fidante Europe). Dividend grew strongly in the last 4 years. The board declared $0.16 cents for the 1H 2016 with dividend date of 29th of February. 2H 2015 came in at 0.155 cents per share which makes FY2016 CGF dividend growth positive. Review of results shows the both Challenger Life and the funds management business are firing on full cylinders. Total assets in Challenger Life increased to $12.8 billion, up 13% for the year. This is positive in light of discontinuation of Care Annuity in November 2014 and the replacement product CarePlus only commenced in August 2015. Net retail annuity growth grew strong within this context at 9.4% or total retail annuity flow of $2.8 billion. Implying institutional sales of $900 million with total sale of $3.8 billion. Average term of the new business sale is 6.4 years which imply a run off rate of 15.6% for the existing portfolio (high level). Life annuity account for 17% of total in the retail segment, a dip vs FY14 due to drop of Care Annuity product. Total asset under management (AUM) increased 18% from $50.7 billion to $59.8 billion. Improvement in CIP net income offset 5% decrease in Fidante. Under the hood shows Fidante base income increased while CIP net income came from performance fees. ROE strong but business trades at multiple of book so that needs to be accounted for in valuation. Full year dividend increased to 30c per share in 2015. (14.5 cents already paid plus full year final dividend of 15.5 cents). This is conservative total payout ratio given only 50% of current earnings are paid out. Dividend going forward will be fully franked. We are anticipating gradual increase in dividend partially supported by earning growth as well as increase in payout towards 60% in the next few years. While management has scope to increase dividend in the future given the low payout ratio. We are cognizant that additional capital would be required to support the annuity business growth. Paradoxically, the faster the annuity business grows more capital it needs but given the strong normalized pre tax ROE of 19.9% in FY15. This is a good problem to have. This is perhaps the large reason in the reinstatement of the shareholder reinvestment plan. Business Overview – What is an annuity? Challenger through its main business Challenger Life is the largest provider of annuities in the Australian market. Annuities provides a steady stream of cashflow over a fixed period or the life of purchaser. Benefit of annuities verse investing directly in the markets is the shift in investment risk to the seller. Essentially the purchaser of annuities mitigates longevity and investment risk in return for credit risk of the purchaser. Credit risk for annuity provides is mitigated to an extent through regulation where APRA determines the level of capital required for life insurers and annuity providers. Challenger in return in issuing the annuity receives the total funds today and reinvest it to earn a higher return. Similar to a bank deposits which earn the spread, Challenger Life’s earnings are the difference between what was promised to the seller and the actual investment return. Total return for challenger’s annuity business is predicated on annuity pricing and future investment returns. Chart below highlight the typical margin of the annuity business and the return on equity for challengers life business where typically the annuity business is held. Key risk of the annuity business is the asset and liability management. The liabilities are the annuity coupon payments with the underlying investment asset income. The breakdown of asset and liabilities show that in the short term <1 year and 1-3 years. Asset and liabilities are broadly matched. Challenger annuities business can be broken down between the institution and retail annuity segments. The primary driver of future annuity sales growth is the baby boomer retirement and shift of accumulation of the vast super funds to pension phase. On the distribution front, it is positive to see the brand recognition it has with advisers. This is also reflected it being on approved product list of all major banks fund management platforms. Positive to see continue trend into industry super funds to tap that growth market. Management highlighted the perceived negative impact from the current low RBA cash rate and future annuity sale. Figure below shows volume flows is relatively sticky even under low interest rate environments. 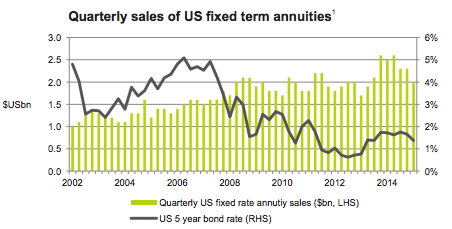 So far underlying Australian annuity sale trend is similar to the US where total annuity sale is not negatively impacted by low interest rates. Interesting to see if low cash rate actually improve retail book going forward as retirees are less able to be dependent on term deposits and unwilling to take market risk (such as Fixed Income ETFs) and allocate to annuities instead. The business prefers long life assets which are severely limited in Australia. This is why it had a mortgage (pre GFC) and debt origination business to source appropriate assets for the life portfolio. One standout asset class however is real estate. Due to long life nature and illiquid nature of the asset class. Theoretically CGF ASX can withstand commercial property cycles and ability to hold illiquid assets due long term liability it is one of the perfect asset classes in the life portfolio. Largest asset allocation is fixed income which account for more than 66% of assets. Lowest being equity and others 7% and 4% in Infrastructures. CGF is aggressively increasing exposure to the real estate sector in the asset allocation decision where real estate account for up to 23% of the assets. This can be attributed to the growth in the life book as reinvestment in real estate is required in order to maintain existing portfolio weight to the asset class. 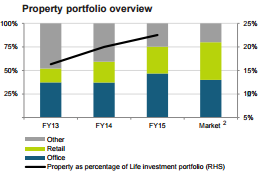 Retail and Commercial Real Estate account for majority portion (75%+) of the Challenger life property portfolio. Retail assets are neighborhood and shopping centres.